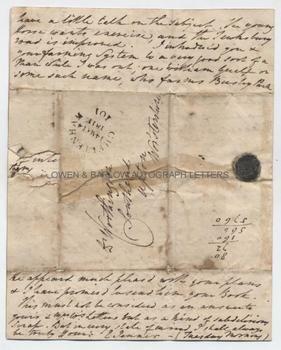 EDWARD JENNER Autograph Letter Signed. British physician and pioneer of vaccination. ALS. 4pp with integral address panel postmarked Cheltenham, 14th Ma[rch], 1811. To Dr Worthington, Southend, Upton, Worcestershire. 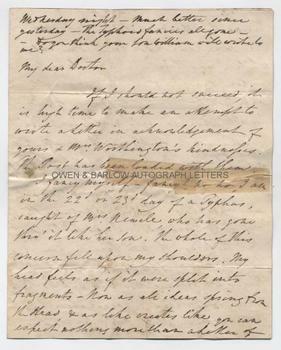 "My Dear Doctor, If I should not succeed, it is high time to make an attempt to write a letter in acknowledgement of your's and Mrs Worthington's kindnesses. The post has been loaded with them. I fancy myself - fancy? Ho-ho - I am in the 22nd or 23rd day of a Typhus caught of Mrs Newell, who has gone thro' it like her son. The whole of this concern fell upon my shoulders. My head feels as if it were split into fragments. Now, as all ideas spring from the head, and as like creates like, you can expect nothing more than a letter of fragments - shreds - patches. There were some new London Cries come out while I was there. I have been to London, dragg'd up in this miserable condition to the Bar of the House of Lords. There, I soon got into confusion. Tho' I endeavoured to drill the small stock of intellects I took with me and husband them in the best manner, yet I found broad cast the order of the day, and the waste was shocking. To use a popular phrase, not of the best order, I was bother'd. But the cries - the new cries - you shall have them. "Famous and excellent - Bravo Dr Worthington - Who is Dr Worthington? - Where is Southend? - Vaccination has not had such a lift this many a day - Where can we procure some copies, etc, etc, etc". I only wanted you to have been present to have made the gratification I felt at this completely complete. Did I not tell you that this gallant exploit of yours would exalt you from the Ranks to a post of the highest honor [sic] among Vaccina's Chiefs. There was no reply in the last Chronicle and I have not heard of any for the next. I have an oppressive pain in my forehead and eye balls - a cascade in my left ear and bells in my right. Constantly drowsy - appetite gone. I am either as hot as a Hob or as cold as the clay on the Cotswold Hills. My dear wife thank God is better; but I have another hysterical domestic to add to the sick list - poor Lucy. Her hands had been clench'd for eight hours and with the key of Dr Curry I unlock'd them this morning in eight seconds. Has your eldest son made up his mind about the line he means to pursue? What if he and I were to have a little talk on the subject. The young horse wants exercise and the Tewksbury Road is improved. I introduced you and your farming system to to a very good sort of a man while I was out, one William Guelf or some such name, who farms Bushey Park. He appeared much pleased with your plans and I have promised to send him your book. This must not be considered as an answer to your's and Mrs W's letters but as a kind of subdelirious scrap. But in every state of mind, I shall always be truly yours, E. Jenner. (Tuesday morning). Wednesday night - much better since yesterday - The Typhoid fancies all gone - Do you think your son William will write to me?" Bifolium. Approx 9 x 7 inches. Some horizontal tears which have been the subject of old tape repairs (and consequently in want of a little restoration) but without any loss of text.. A little age toning. All else very good. 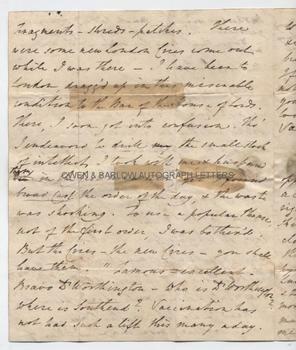 A fascinating and important Edward Jenner letter, apparently written in the grip of typhus fever, which as far as we can establish is entirely unrecorded and unpublished. Edward Jenner is known to have suffered from a serious illness in the early part of 1811 and to have spent a few days in London in March of that year. The progress of vaccination was not without its setbacks. In some quarters Edward Jenner was lauded. He had been elected as the English representative on the French academy of science following the death of Nevil Maskelelyne that year, he had been the subject of several poems and was very highly regarded by Joseph Banks and the Royal Society. However, his National Vaccine Establishment also had its detractors. In 1811 Edward Jenner had learned of a Bill for the eradication of small pox which was before Parliament. Thinking it might have been ill-considered he asked to see a draft and made several amendments. However, he was later astonished to find that it had been presented in its original form and had been received with aversion. Also in 1811, the son of Lord Grosvenor (who had previously been vaccinated by Edward Jenner) developed small pox, and this had caused much clamour and debate about the effectiveness of Jenner's techniques. This led to the publication of a special report that completely exonerated Edward Jenner and his treatments. The Rev.Dr. Worthington was a lifelong friend of Edward Jenner and is believed to have been consulted on Jenner's original paper on Vaccination and to have made recommendations about the form in which it was first published. It appears from this letter that Worthington had published an article in The Chronicle, which had aided Jenner in his struggle with the anti-vaccination movement. 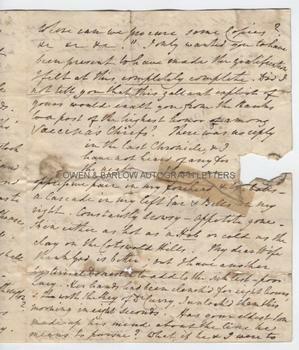 The autograph of Edward Jenner is scarce and much in demand and this is one of the best letters by him that we have seen. Provenance: From the 19th century album of Emma Marshall of Penwortham Lodge, Preston. Emma was the daughter of William Marshall, landowner and cotton manufacturer and related by marriage to the Miller family of Baronets, M.P.s and landowners.